Simply by connecting the Fiber-optic cable (L-type) to the connector, the light of the digital camera’s built-in flash is detected and connected to an external strobe.This is considerably less complicated than setting up an electrical connector that requires detailed knowledge. It also eliminates any risks involved when the connector is submerged in water. When using a YS Converter/C to enable the TTL auto adjustment, use a Sync Cord/N to connect it to a genuine SEA&SEA strobe. *Optional YS Converter/C 6 pin Connector is required. Compatible with the VF180 1.2x viewfinders. Customer-replaceable strobe connector (Optional Sync Cord 2 pin connector) is available. Remove the accessory connecter cap and install the Optional Sync Cord / N. Then the 5-pin Sync Cord/N or the 5-pin Dual Sync Cord/N will be useable. New type of easily operated shutter lever, excellent for quick snapshots. The shutter lever can be operated in two ways – pushing from the top or pulling from the front – and offers a smooth halfway press for adjusting the autofocus so you need not worry about any missed chances. When using the optional Grip-Stay L, you can hold the camera firmly with both hands just as you can with conventional housings. The MDX-D800 is part of SEA&SEA’s latest housing series which is precision machined from solid block aluminum and designed for ultimate performance and ergonomics. 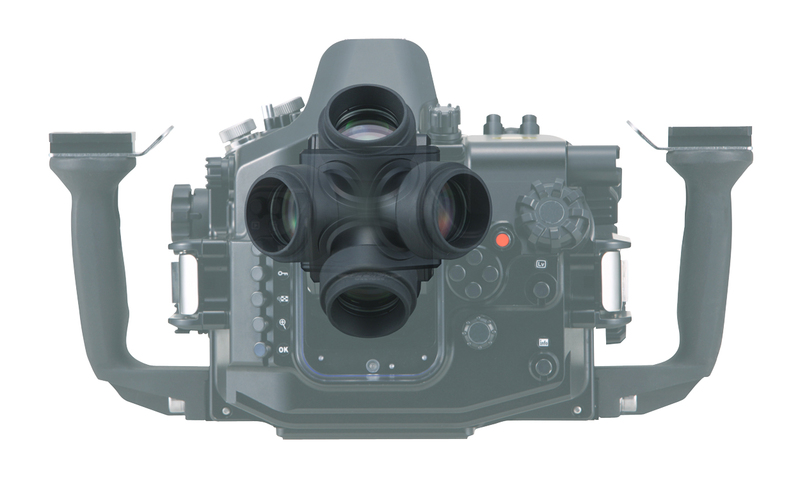 The MDX-D800 is compatible with current NX Series ports, digital strobes and accessories. • Housing is precision CNC machined from solid block aluminum. 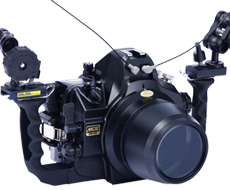 • Ergonomically designed for ease of use and control of the D800/800E functions underwater. • Protected by a highly corrosion resistant anodized (blue) coating. • A/R (anti-reflective) coated LCD rear display window accepts optional VF-45 and VF-180 1.2x prism viewfinders. • Dual fiber optic cable sockets ideal for Slave TTL lighting options. Sea and Sea housing for Canon 5D Mark 2 (Discontinued look for used ones) Nexus still makes this housing. By attachment of a 45° viewfinder (view magnification of 1.2x) with Amici prisms to the eyepiece on the housing, the magnification increases to 1.2x, allowing the entire field of view to be seen clearly. Recommended for users committed to strict compositing and focusing. MDX housing for Canon EOS 7D, supports fiber-optic cable connection. Simply by connecting the Fiber-Optic Cable (L-type) to the connector, the light of the digital camera’s built-in flash is detected and connected to an external strobe. This is considerably less complicated than setting up an electrical connector that requires detailed knowledge. It also eliminates any risks involved when the connector is submerged in water. Compatible with the VF45 1.2x and the VF180.1.2 external viewfinders. By attachment of a 45° viewfinder (view magnification of 1.2x) with Amici prisms to the eyepiece on the housing, the magnification increases to 1.2x, allowing the entire field of view to be seen clearly. Recommended for users committed to strict compositioning and focusing.Unparalleled design provides easy access to the main dial and the quick control dial. Shutter speed and aperture can be adjusted without removing your hand from the grip. Button to activate live view photography and video is ergonomically positioned for easy access. While holding the grip, you can control AE lock / Index / Reduce lever and AF point selection / Magnify lever and AF start lever to check focus points and then press the start / stop button to record video. The setting button is also situated close to the grip for quick access to the button. Great functionality, engineering and ergonomic design make this housing exceptional. When the Nikon D7000 camera is used with a SEA&SEA strobe equipped with the DS-TTL function, the DS-TTL metering has been found to be sometimes unstable in testing. The YS-01 (#03112) and the YS-110? (#03111) strobes are not TTL-compatible when the strobe are set in DS-TTL mode. The strobes and D7000 camera synchronize without any problem in manual mode. It is highly recommended to use the strobes in manual mode when using the Nikon D7000. ?When a SEA&SEA strobe with a standard Nikonos type connection and YS Converter/N is used in TTL mode with the Nikon D7000, it has been found that the strobe sometimes fail to fire in testing. Due to these results, the YS Converter/N is deemed not compatible with Nikon D7000 in TTL mode at this time. However, the D7000 and YS Converter/N may become compatible if a firmware revision is possible. *“Flash Mode/Flash Exposure Compensation Button” and “Shutter Release Mode Dial Lock Button/Shutter Release Mode Dial” are not available with this housing. *The housing cannot be modified to be equipped with “Flash Mode/Flash Exposure Compensation Button” and “Shutter Release Mode Dial Lock Button/Shutter Release Mode Dial”. The production number for this model is limited. High image quality with approx. 18 million pixels allows you to take Full HD video. *The housing becomes compatible with EOS REBEL T1i/EOS 500D and REBEL XSi/450D by replacing the rubber button (accessory). *When REBEL T1i/XSi (EOS 500D/EOS 450D) camera is mounted, the Live View housing button (still/movie) cannot be used and the ISO button on the camera cannot be used. *When the EOS REBEL Xsi/EOS 450D camera is mounted, please note (the accessory rubber tip included with the housing is required). The Live view/Movie button on the RDX-550D functions as the WB button on the EOS REBEL Xsi/EOS 450D camera. The White balance button on the RDX-550D functions as the metering mode button on the EOS REBEL Xsi/EOS 450D camera. New lineup of ports includes the RDX Standard Port (for most standard zoom lenses), the RDX Port Base L (for joint use with NX-series ports) and the RDX Port Base S (for joint use with compact macro ports). Using the appropriate port base, you can use any type of existing NX ports, expanding the range of lenses that can be used. A new type of easily operated shutter lever, excellent for taking quick snapshots. The shutter lever can be operated in two ways—by pushing from the top or pulling from the front—and offers an option for adjusting the autofocus by pressing the button halfway down so you need not worry about any missed chances. 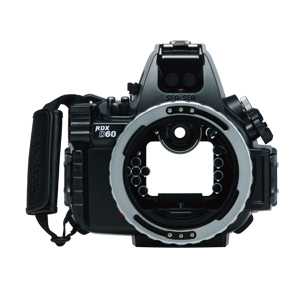 *The image Shows the RDX-D60(Housing only). Grips and port are sold separately. *RDX-D60 housing and Standard Port Set consists of RDX-D60 housing and RDX Standard Port. Relevant Information *Active D-lighting / Reset button on the RDX-D60 housing controls shooting information / reset button on the Nikon D40 camera. Simply by connecting the Fiber-Optic Cable (L-type) to the socket, the light of the digital camera’s built-in flash is detected and connected to an external strobe. This is considerably less complicated than setting up an electrical connector that requires detailed knowledge. It also eliminates any risks involved when the connector is submerged in water. 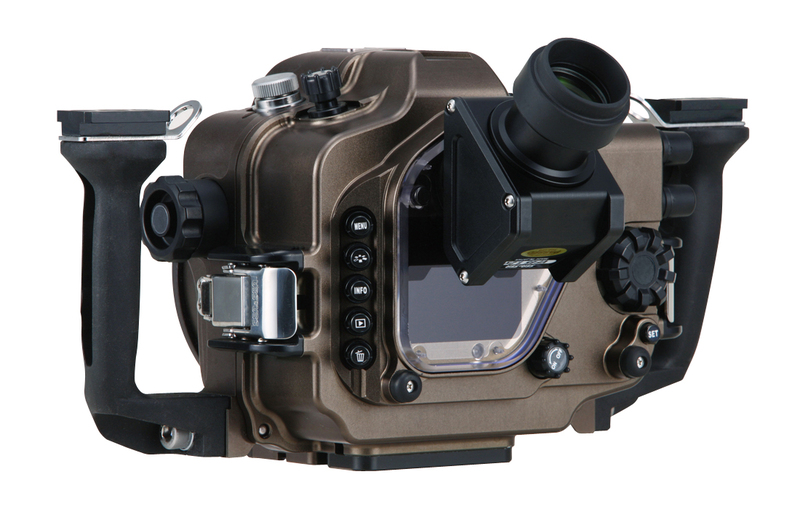 Although this housing is designed with beginners in mind, we have strived to ensure that it will satisfy even the most professional digital SLR diver-photographers, paying special attention to superb underwater performance and to its strength and solidity. After repeatedly subjecting it to exacting pressure tests, we have absolute confidence that we have achieved a compact design with a depth rating of up to 60m / 200ft. When using a YS Converter/N to enable the TTL auto adjustment, use a 5-pin Sync Cord/N to connect it to a genuine SEA&SEA strobe. Camera quick shoe for easy mounting and removal of the camera. Mounting the camera becomes a breeze. Sea and Sea U/W Housing for Canon EOS-1D MarkIII / EOS-1Ds MarkIII (Discontinued look for used ones) Nexus still makes one for this camera. Customizing the housing offers additional functions. You can replace the 6-pin wired TTL converter connector on the top of the housing with a 2-pin wired strobe connector for an additional cost. This modification provides two 2-pin wired strobe connectors so you can connect two SEA&SEA YS-Series strobes. *This modification does not support automatic TTL flash adjustment. *It requires the 5-pin Sync Cord/N. By attachment of a 45° viewfinder (view magnification of 1.2x) with Amici prisms to the eyepiece on the housing, the magnification increases to 1.2x, allowing the entire field of view to be seen clearly. Recommended for users committed to strict compositioning and focusing. Fully strove for a unique structure where the main command dial and subcommand dial can be reached easily. As a result, achieved a structure in which the sub-command dial was moved even closer to the grip than in previous models by adjustment of the chassis inside the housing. Can adjust the shutter / aperture in a snap while holding the grip. With just the right amount of clearance that can’t be found anywhere else, this design realizes high hold to ensure an ideal shooting position. YS converter connector employed as standard. When using a YS Converter/N to enable the TTL auto adjustment, use a 5-pin Sync Cord/N to connect it to a genuine SEA&SEA strobe. Controls almost all of the Nikon D300s essential functions underwater. The housing is protected by a highly corrosion resistant, anodized coating. The coating protects the housing from environmental corrosion and abrasions. Features a slanted (sideways) button on the back with an original structure. For balancing even more active functionality and styling in high dimension. Furnished with a tripod socket in the central region of the bottom surface of the main body. If you remove the attached Ergo Grip, you can also add an optional Grip-Stay L.
Comes standard with two bulkhead connectors: one type-N connector (2-pin wired for manual) and one 5-pin wired connector (for dedicated TTL). Equipped with a Optical Viewfinder 0.5x standard. Interchangeable 0.66x/0.8x viewfinders (optional) are also available. *The MDX-D300s housing comes from the factory with these type-N connectors: one 2-pin wired connector and one 5-pin wired connector. *To use two SEA&SEA YS-Series strobes with the factory-equipped type-N connectors, you must use the 5-pin Dual Sync Cord/N.